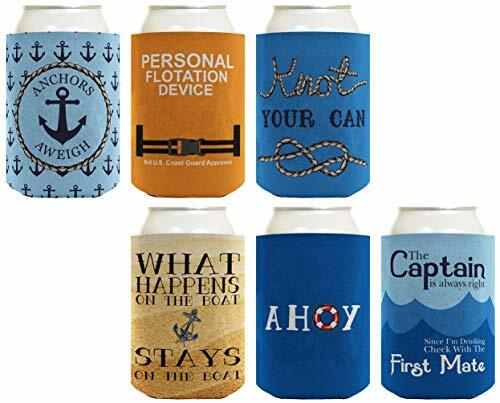 Nautical coolies make excellent cruise gifts, boat captain gifts, or nautical party favors. This vintage style can cooler is perfect for keeping your drink cool while the party heats up. Coolies make a great gift or party favor. They are a memento with purpose and lasting value. Premium 1/8 inch thick high density open cell polyurethane foam keeps your drink perfectly insulated. Coolies fold flat for easy storage and are machine washable. A great new boat owner gift or birthday gift for a sailing enthusiast. 1 of each design pictured is included in this bundle for a total of 6. You have chosen a 2-pack. You will receive 2 can coolies. Premium full color sublimation printing creates vibrant and long lasting colors.